Elephant Lullaby have you heard that? Lek an elephant master was made her Lullaby video to show that even animals know that its bed time. Sangduen “Lek” Chailert was born from northern Thailand. Her advocacy in loving this big elephant was started when her grandfather a "traditional doctor" got an elephant from his patient as a payment for saving his life from illness. This was a baby elephant and they named it "Tongkum" which is means "Golden One"
In this Video an Elephant Lullaby that Lek show us. By this simple video Lek is telling us how to love such big animals like elephant. Lek was showing us that we can also interact with this big animals that an elephant can also feel and understand what we want. Know what, I've watch this video, even she don't say anything but just hymn I can feel that shes saying that "all animals are gift from above. so you have to treasure it. Loving an animals such like this is such a blessing to all of us". 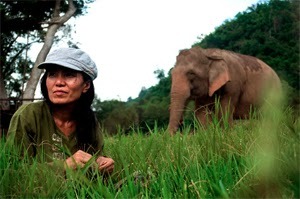 Lek is still fighting for those greedy abusers of elephant. As I've remember in Philippines Ton of elephants Ivory was caught of Philippines police. According on what I've heared that it is almost 2 tons that came from africa. This is already disgusting to all of us, Let us all open our eyes that this lovely creature must be protected. Maybe some are asking why is that Lek waving her scarf while singing the Lullaby. According of what i've experience, The house of an animals always have many insects such as Flies and etc. so for me that means that insects might disturb the elephant so Lek waving her scarf so that she can driven away the insects. Let Us support Lek in loving not only Elephants but also different species.